At FMSC, we believe working together drastically reduces the time it takes to transition a person from relief to resiliency. Providing FMSC MannaPack meals to those without a sustainable source of food creates a solid foundation to help them regain their footing and provide for themselves consistently. 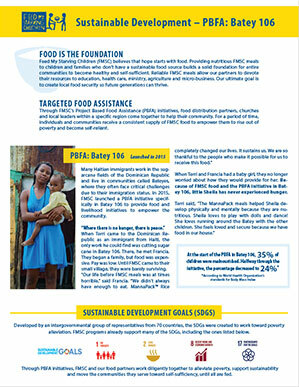 FMSC partners are embedded in communities and help them advance as circumstances realistically permit. Meal supplies are reduced as the community progresses. It is extremely difficult to develop individual livelihood and community sustainability while battling malnutrition. Since many communities lack local food sources, or families cannot afford to buy food, FMSC MannaPack meals act as a bridge toward creating local food security to ensure future generations do not go hungry. Food assistance is vital in the process of transitioning individuals, families and communities out of desperate hunger and poverty and into self-sufficiency. FMSC has created several programs to make our food assistance model even more effective. 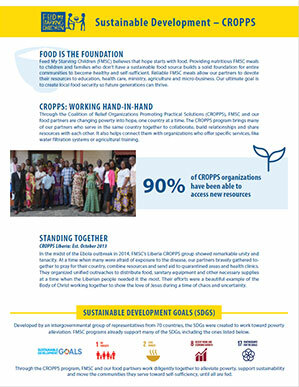 The Coalition of Relief Organizations Promoting Practical Solutions (CROPPS) helps our food distribution partners work together to develop close working relationships with other ministries and organizations in their areas to enhance food relief and sustainable development efforts. FMSC also connects our food distribution partners with Solution Providers, a collection of like-minded organizations that provide expertise in accessible safe water, agriculture, spiritual development, medical care, education and more. By working together, each FMSC partner and Solution Provider plays a part in breaking the cycle of poverty. "CROPPS has completely revolutionized our organizations. It allows us all to enlarge what we do." Through FMSC’s PBFA initiatives, distribution partners, churches and local leaders within a specific region come together to help their community. For a period of time, individuals and communities receive a consistent supply of FMSC food to empower them to rise out of poverty and become self-reliant. At FMSC, we believe that food assistance and community development work together. "There's all this space on the spectrum between relief and development. 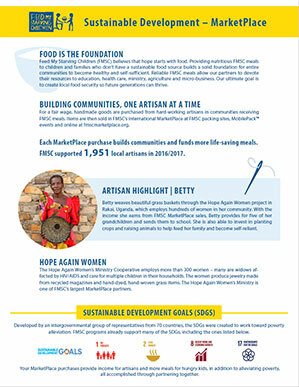 FMSC thrives across the entire continuum." For a fair wage, the MarketPlace purchases hand-made goods from hard-working artisans in the communities that receive FMSC meals. 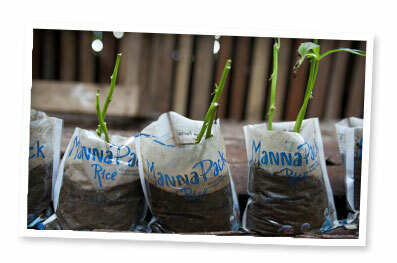 The items are then sold in our international MarketPlace at FMSC packing sites, MobilePack events and online. MarketPlace purchases build communities and profits go back into our feeding programs. In 2015, MarketPlace supported 1,911 local artisans in communities that receive FMSC meals. "Before discovering FMSC we could only feed a small group of people several times per month. Now with FMSC we are feeding thousands of people several times per week. The aid we receive is life changing for the people we serve there. People have told us they appreciate the delicious and nutritious food because it feeds their bodies so they can work harder and have extra to spend on improving their homes, for medicine and for educating their children." See how your organization can be a part of one of FMSC’s sustainability initiatives. Please contact us at international@fmsc.org.